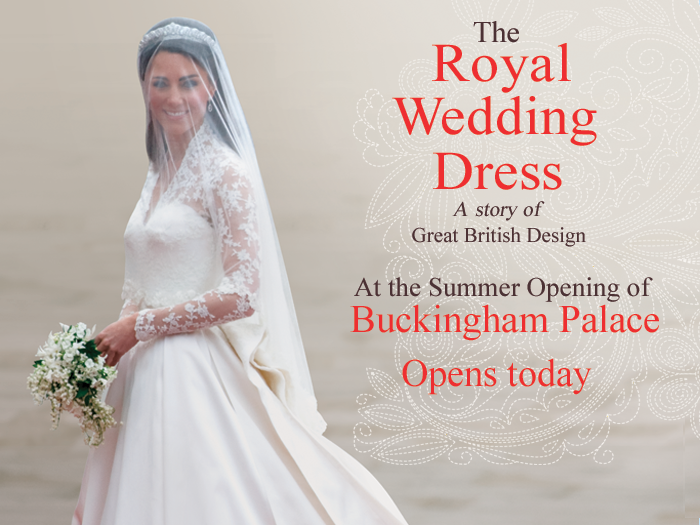 As many readers are already aware, Kate’s wedding gown is part of a special exhibit this summer at Buckingham Palace. “The Queen and the Duchess were given a sneak preview of the exhibition, which opens to the public tomorrow. The monarch led the way and, with her hands clasped behind her back, strode into the Ballroom and stopped about 10 feet from the dress with Kate standing beside her. Kate countered with her own view and said it had a ”3D effect”. 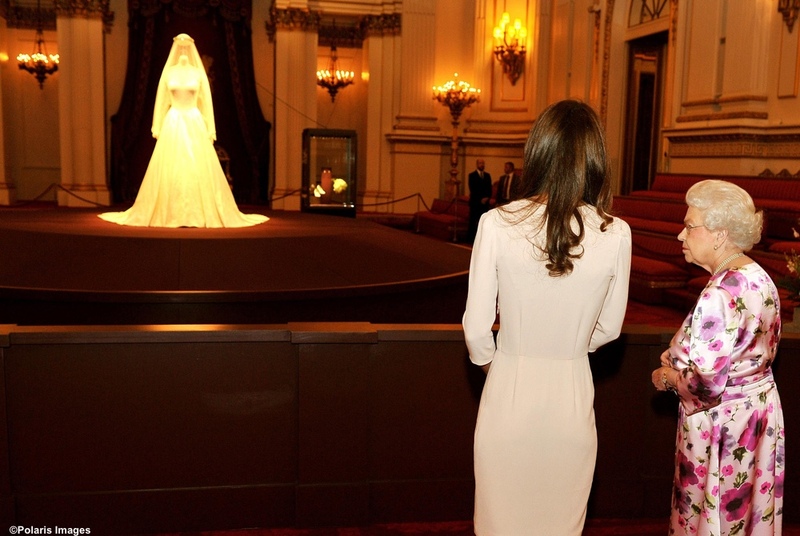 Apparently Kate had an early look at things Wednesday evening, prior to viewing the exhibit on Friday with the Queen. We move on to the exhibit itself, clearly Sarah Burton’s design for Alexander McQueen is the star of the show. “Once the lace design for each panel was finished it was pinned to lengths of silk tulle which were sent to the Royal School of Needlework to be appliquÃ©d to the tulle by a team of embroiderers. Once completed the appliquÃ©d lace was cut away from the silk tulle and sewn onto the satin gazar by the seamstresses at Alexander McQueen. 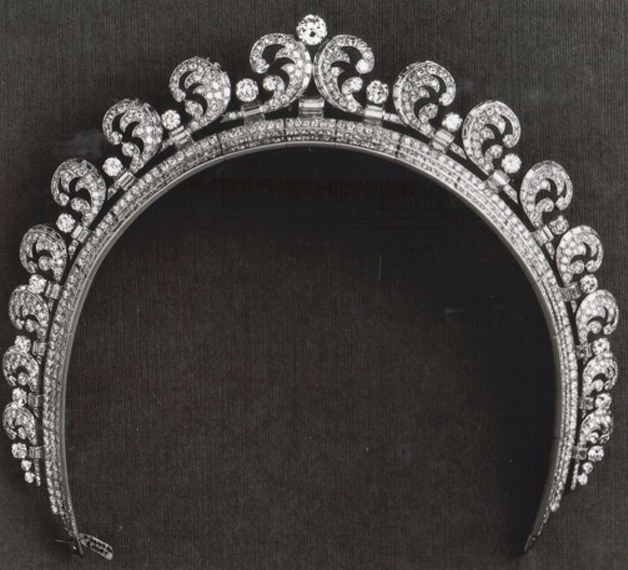 Here is a different view in a photo The Jewellery Editor acquired from the Cartier archives. The Alexander McQueen shoes are also displayed. Here we have a better view of the intricate lace, the same created for the dress. 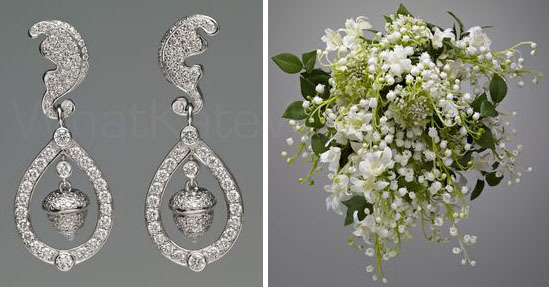 The earrings and a silk replica of Kate’s flowers are also part of the exhibit. It looks like an amazing exhibit, even if the display strikes some as eerie. A number of WKW Facebook community members are actually going to see the exhibit, it will be wonderful hearing their reactions. Kate wore a dress by Joseph, Annoushka earrings and her Asprey pendant. To see the BBC story with the Queen’s comments on the exhibit, click here. If interested in seeing The Royal Collection site, click here. The Daily Mail‘s story is here. The Telegraph‘s stories are here and here, the photo gallery is here. The Huffington Post story is here. The stand should have been more flesh coloured so that you could better see the intricate lace. Lovely display… Is it me or is McQueen spelled wrong on the cloth under the shoes? It’s the McQueen logo. If you look carefully, you’ll see the lower-case C is inside the upper-case Q. Even worse – for the general public to see the dress has been ‘protected’ by a giant mosquito net suspended from the ceiling so that you cannot properly see it, what with that and the subdued lighting it has the effect of blurring all the wonderful detail in the lace !!!! A certain friend of mine & fellow WKW devotee is seeing this show next week, hurrah! Until I get her detailed in-person report, I’ll be revisiting this point. Also – don’t hate me – but is it wrong that I find those nuptial heels a bit . . . well, dull? I’m not sure what I was expecting, but I don’t think those are them. Maybe something a bit more fashion forward hidden beneath that rather traditional (and gorgeously so) dress? Not to worry, however – I remain fully in awe of the rest of the wedding wardrobe. The Queen’s comments were the truth. The suspended tiara and veil is horrible and creepy looking and whoever designed it must have been in a position of power and authority and whose word was the last word and that’s what happens when someone is beyond reproach and nothing negative is ever said. The tiara and veil should have been displayed separately imo. I wonder if the person responsible has any regrets of if they think the queen is just a crazy old lady. Here I’d have to say the queen had the last laugh. And at the very least, from the video I saw, she was smiling when she said it and who would deny she was spot on in her assessment? The Queen gazes at the headless McQueen and cries, “It’s horrible, horrid!” I can understand it might give her nightmares, but I think it’s kinda funny. I love being able to see the detail on the dress. It is so amazing, I wish I could go to London and see it – I even checked out the airfares – talk about something being horrible! How about the price to London from Los Angeles! Can you imagine though, what Kate was thinking as the Queen said “it looks horrible and horrid”. Hasn’t this woman learned anything from the Diana debacle… being that she has to exercise diplomacy at every other level, couldn’t she have softened the blow a little? I doubt that….I think the Queen was just commenting on the display which, given that King Charles I had his head removed by order of Parliament, probably was not the best way to display the crown (which was loaned to Katherine by Elizabeth – it was made for the Queen’s mother as a gift from her father). They could have had a faceless mannequin – one with some color so that the delicate llace on the sleeves could be displayed to the fullest. I doubt that Katherine took it or the Queen meant it as a criticism of the Duchess. From all reports, she is very taken with Katherine. The Queen is a very smart woman. She and Diana may not have hit it off (Diana was a young, naive woman who, though a loving mother, was really, IMHO, a bit of a twit. She and Charles had literally nothing in common – it was a marriage that was doomed to fail. The good that came from it was, and is obviously, William and Harry. They loved their mother dearly, they also love their father dearly and it is obvious that they have a very strong bond. While Elizabeth and Diana may have had their differences (it is the rare mother who will favor a daughter-in-law over a son) Elizabeth has long had a very special relationship with the two sons from that marriage. 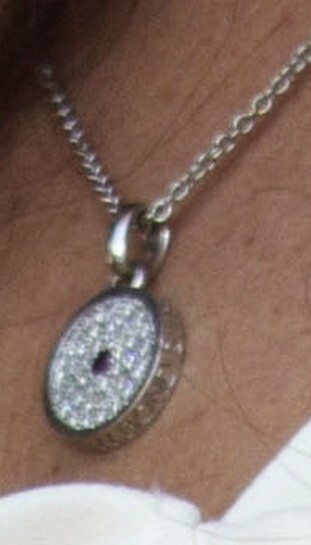 On the edge of the diamond disc necklace, note the engraving of the word BOND. These are other markings, but I can’t make them out. I wish I could fly to England and see that display. By the way, does anyone know if there is a website with pictures of all of Queen Elizabeth’s jewelry? I have googled and can’t come up with much. 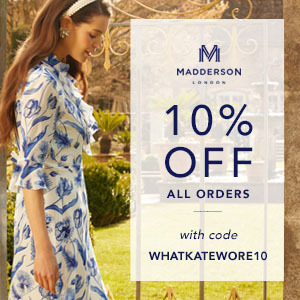 I just want to look and see what Kate may be wearing in the future. Beautiful pics, I love coming back to your blog daily. My fave addition to this post was the shoes, I have been wanting to know what they looked like forever.Thank you! Agree with you about the shoes. I’ve been wondering ever since I thought I saw Kate stumble coming into the Abbey. And there have been any number of styles shown up to now claiming to be the ones. But none as lovely as these. I actually don’t think the lack of head is THAT bad… better than having a fake head put in there! Now that would be creepy. The only comment I have on the exhibit is it’s too bad the dummy is white, it makes it harder to make out all the lace detailing. I could see how the Queen might be a little squeamish at the look of the headless bride as a few of her royal ancestors lost their heads during more turbulent times. The Queen may have been a little disturbed to see a headless royal lady. I can understand that. It’s not particularly tactful, but I guess the modellers were also in a ticklish situation – to display a look-alike Kate head may not have worked very well either, so it was either no head or a facsimile head. Tough decision. I think the dress would show a little better if the mannequin had a little color to it. The scallop on the top blends in too much. It would be tricky to do that without going into the tacky range though. I love the close ups of the lace – it really shows the workmanship. Catherine would look lovely in cerise – perhaps paired with some smashing rubies…? The Queen was just refering to the headless display. What exactly are the rules for tiaras? I know the Queen borrowed it to her for the wedding, but did she get to keep it or is this going to be her signature tiara? The earrings are clearly designed to go well with the tiara and makes me think she plans to wear the two of them together in the future. Interesting they say her shoe size is a 5 1/2 when her size is clearly a 39 as illustrated when she wore the Jenny Packham dress . I think English/British sizes are even different from our own. A 5.5 would be very close to a US 8.5 or 9. I know this only because I’ve been trying to buy the LK Bennett shoes off ebay, and the sizes are all weird. It makes sense. A UK size 5.5 compares to a 38.5 or 39 in European sizing. I’m actually going to be in London at the beginning of next month, how long is it going to be on display for? The exhibit runs until October 3. The detail on the dress is spectacular. The dress is beautiful even if is looks a tad bit strange to be on a headless form The layout of the train is very well placed. The close up pictures of the dress, shoes and earrings were outstanding. 🙂 The detail in every article is just devine, I’m sure Dutchess Catherine felt like a fairy princess on her wedding day. May they have a long and happy life together. It’s great to see the dress in such detail. Getting into the dress must have been a bit of a drama with all those teensy buttons! You didn’t get a full impression of the elaborate lacework on the dress and train when watching the wedding on TV. Well, the American tabloid US Magazine presented the queen’s comments as if they were a joke. I also want to add that I just knew that those horrid, frou-frou pumps by Marchesa weren’t the real deal. Georgina Chapman is simply not in the same class as Sarah Burton and the House of Alexander McQueen. Not even close. I absolutely agree about those Marchesa shoes–not Kate’s style at all! They’re just capitalizing on her name…and now they look like idiots. In Marchesa’s defense, I don’t think it was actually Marchesa or Georgina Chapman who ever claimed to design the shoes. It was simply a scam on ebay. And I’m sure the scammers couldn’t care less whether we think they are idiots so long as they get their payday. Also, the ebay seller has now changed the purported desinger from Georgina Chapman to Georgina Goodman. Wonderful article. What a perfect wedding dress! I hope Kate and William have a long and happy marriage. They seem like nice people.